The materials in this collection explore the drawing as an analytical tool. Selected across projects of different eras, typologies, and locations, the drawings presented here share a role as catalysts for the subsequent design process. If the architectural drawing is perhaps best known for presenting final designs or conveying the technical details required for construction, these drawings function as hybrid documents of image and text that captures a particular moment of observation and conceptualisation in the early design process. The analysis undertaken in these drawings provide thereby provides insight into the principles and conceptual conceits that underlie their respective projects. In contrast to the ambitious, largely tabula rasa projects that mark Norman Foster's years at the Yale School of Architecture, the work completed during his undergraduate studies suggests early approaches to studying and incorporating local context. A third-year assignment at the University of Manchester, for instance, required students to consider regeneration schemes for the town of Lymm, England. The resulting studies completed by Foster map and render elements ranging from the regional topography and plan of the town centre to the distinctive perspectives that contribute to the town's sense. 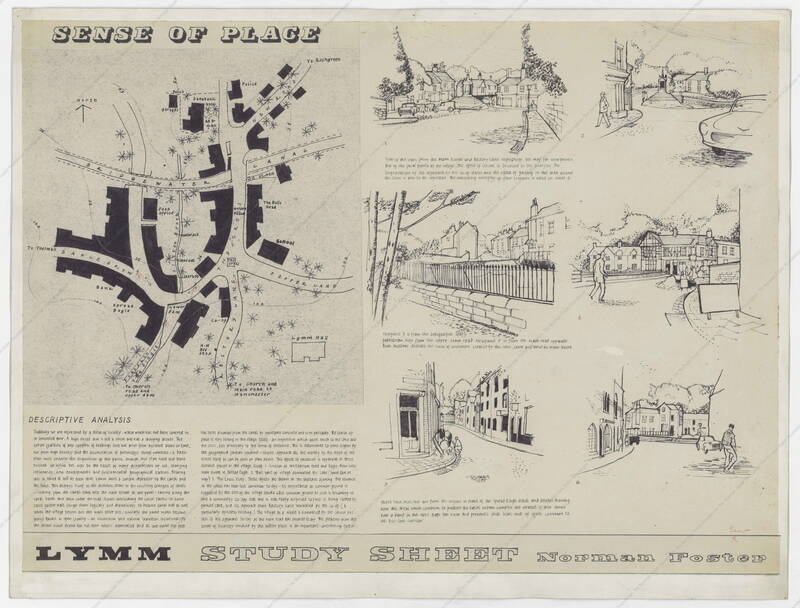 Drawings such as that of the Retreat at Pill Creek analyse the formal aspects of site in order to determine the relationship between building and landscape through the orientation, massing, and materiality of the proposed architecture. 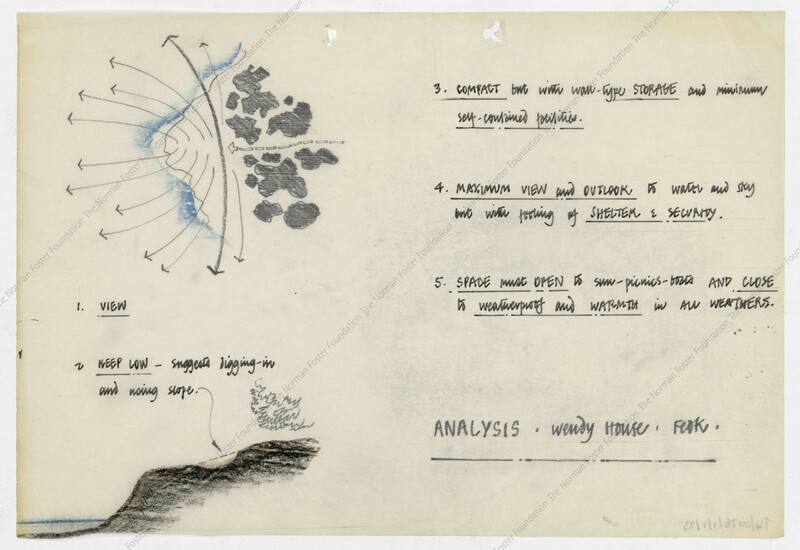 At Pill Creek, for instance, the analytical drawings document the approach through a wooded area to a clearing while noting the potential sight lines upon arrival. The small divot in the hill explored in the drawing becomes the basis for a structure embedded in the slope towards the water. While following sketches explore a box-like structure perched on the crest of the hill, ultimately the topography and siting noted in the analytical drawings become the basis for the distinctive structure nested in the hill that was ultimately built. The initial analysis for the Skybreak house devotes similar attention to the sloped topography. 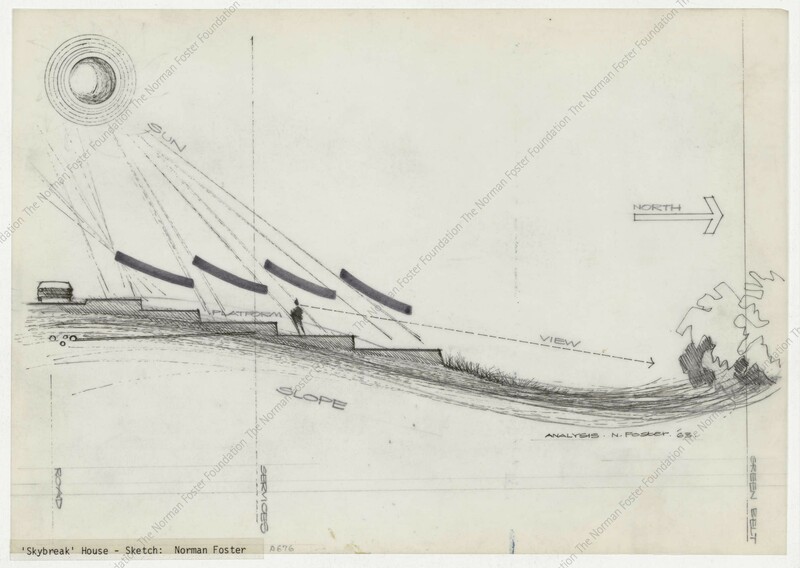 In addition to visualising the desired sightlines from the house, the drawing further marks the path and inclination of the sun onto the site. Notably, the four sectional levels of the resulting Skybreak house not only mirror the stepped form of the analysed landscape but also introduce, through multiple skylights, top daylighting as a central element of the residential structure. In an effort to make visible the intangible elements of a site, the analytical drawings for the proposed BBC headquarters introduce time, history, and memory as further dimensions of architecture. The drawings study Portland Place from 1717 onward, charting the evolution of the street and its changing sight lines, scale, and materiality. The final analytical drawing which captures the changes from the 1920s onward laments the ways that individual high rises and modernist skyscrapers have ignored their placement in this broader urban scenography and blocked the views of the landmark All Souls Church. This excavation of the historical connectivity of the street, its landmarks, and its public spaces thereby informs a proposed building that intimately responds to its surroundings by creating glass arcade through the building connecting All Souls Church with Cavendish Square. In urban contexts, analytical sketches such as the Context Sketch for the Great Court at the British Museum continue to evaluate the formal fabric of the city while also considering flows of people and broader networks of place. The Context Sketch for the Great Court at the British Museum, for instance, places the museum at the centre of a network of corridors and public spaces that range from Trafalgar Square to St. Pancras Station. We can see this analysis reflected in the central conceit of the built work to exist fundamentally as an urban public space connected to the city at large, rather than a discrete intervention for the interior of the museum.